Take notes. This is how real countries respond to threats and domestic terrorism issues. It only takes one big incident and they are already creating a new gun control bill to help prevent future occurances. For the US it has been happening for 20 years straight and the frequency of these incidents here is only increasing and almost nothing has happened to combat it because republican senators / house reps are almost always bought out by gun companies and NRA. 70%+ of American (repubs included) want tougher gun laws. You just have the complete nut jobs that appeal to fear and won't concede anything because they irrationally think that all guns are going to get banned. Yep, our country is screwed. 20 years of mass shootings increasing every year and nothing is done. It's pathetic. Almost all republicans are owned by NRA special interests and gun companies. Take notes......what has been the overall trend of people killed with guns even with an increase in gun ownership? You think banning a certain thing is going to stop a mass murderer for doing their killing? They will just switch to other means to achieve their goals. Taking away guns from law abiding people will end up killing more people in the long run. Only criminals will have the weapons , is that your goal? You go ahead and be a "real Country". I'm sure it will work out for you. Here in the US we have a way of changing our Constitution. This has absolutely nothing to do with what I said, most of that is a straw man. The point was that they are actually doing something about it. US has let it go for 20 years and done almost nothing while the amount of mass shootings increases every year because our congress is OWNED by big gun and NRA special interests. All they do is spread fear and it works because conservatives are generally guided by fear in their everyday lives and buy right in. I don't believe in taking away guns, I believe in better regulation and extensive background checks like 70%+ of the country. It's absurd that it has taken more than 20 years just to get a bill on that past the house when increased background checks are so widely supported by the US population. Mass shootings are a real national emergency, but conservatives simply don't care about it. They care more about protecting a fetus than living breathing people today. This is how real countries respond to threats and domestic terrorism issues. Democrats could have passed full blown gun control during the 2009-2010 Congressional session. Probably because Obama was too busy fixing the recession directly caused by GW Bush. Kind of like how Trump could have passed the wall bill a year earlier with more funding or anything else he wanted during his first 2 years but barely did anything. Brilliant red herring. Kind of like how Trump could have passed the wall bill a year earlier with more funding or anything else he wanted during his first 2 years but barely did anything. The President can pass bills? When did this change? Never heard of the No Real Scotsman fallacy I see. Another one of the Left's fallen heros who won't admit he did anything wrong. Ellison lecturing on skin color Nationlism is rich beyond compare. Keeping your guns is what's keeping you still free. Never do the mistake to give those up. Never. Of course, you might reasonably be misled to believe that silly graphic. 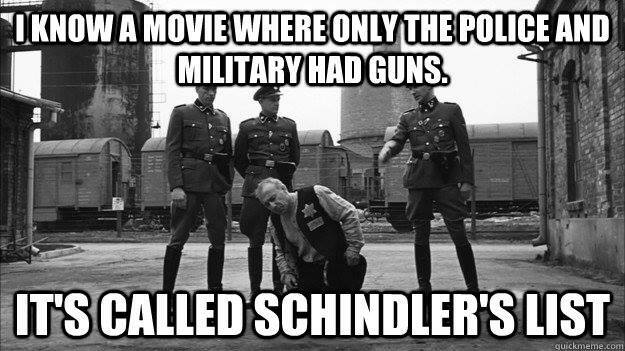 However, during Nazi Germany, members of the public, who weren't either police or military, were allowed to own their own guns. I'm very well aware of all that, that being said I'm very well educated. Do you think if we all drank poison, it would protect us from being surreptitiously being poisoned by some deranged poisoner? The argument that we'd be protected from being shot by arming everyone (even criminals and the insane) is just as fallacious. Also, if the government wanted to shoot you, they totally out-gun and out number you. You would have no defense against them. Having a firearm in your possession gives them an excuse to fire upon you, because they could claim self defense. It would be safer for you to run and hide. A gun doesn't, and cannot, make you 'free'. It does make you a target for the better armed.